McCain Advisor: "Think Mexico First"
"We are betting that the Mexican-American population in the United States... will think Mexico FIRST! ...But now I want the third generation, the seventh generation, I want them all to think 'Mexico FIRST'," so said Dr. Juan Hernandez on the popular broadcast Nightline, June 7, 2001. Anyone who has seen the dual-citizened Hernandez in media interviews knows that his rhetoric is offered with forked tongue smoothness. As a former advisor to Mexico's former president Vicente Fox, his credentials for having less than 100% loyalty to America's interests is easy to point out. He has in his own words defended Mexican bus operators bringing illegal aliens to America. He is on record as supporting driver's licenses for illegals in the U.S., in addition he has advocated vociferously for easier methods for illegals to send money earned in the U.S. via special banking agreements to Mexican citizens, as well as advocating for the implementation of mortgage programs for illegals who are working in America. Sum it up by saying that on nearly every issue in which the American interest was at odds with the interest of Mexican illegals, or Mexican nationals - Hernandez sided against America. Well for starters he has been closely related to the McCain campaign for President 2008. Which is troubling for many reasons. In the border fence debate in 2007, McCain showed more contempt for his fellow Americans, his fellow Senators, and the voters he was even then campaigning in front of than can be recalled in recent years. Claiming to literally "know more" about the issue of border security/illegal immigration than anyone else in the room, he watched in anger as his arrogance went down to flaming defeat. Showing even more contempt for the American people he has mocked citizen border patrol who voluntarily use their time insure legal border passage of those seeking it. And with a reverberation that echoed around the nation John McCain cursed American voters by saying, "I think the fence is least effective. But I'll build the goddamned fence if they want it." How gracious of him to oblige us with such enthusiasm! Then the intensity of the 2008 campaign trail kicked in. McCain found himself increasingly outnumbered by Americans who didn't much appreciate his arrogant ignorance of border security and what it meant to the average American. He resisted to his earlier urges which likely would have caused him to mock Americans who really want nothing more than for those crossing the Mexican/American border to simply do so - over there at the legal crossing point, with proper I.D. Americans aren't confused, we understand just how reasonable such a policy is. 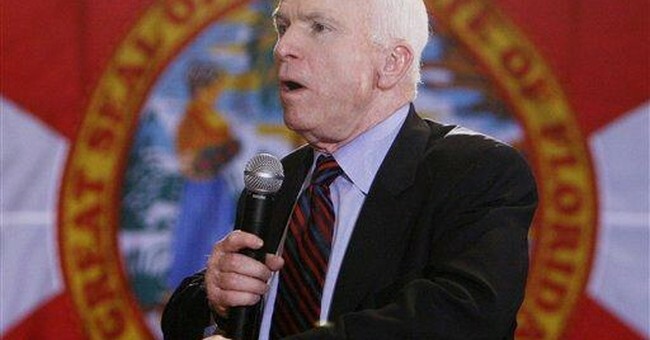 Nonetheless faced with the open hostility McCain began to back-peddle, morph his language, and modify his position. In the aftermath he picked up two serious victories - albeit that they occurred in "open" primary voting. I honestly think voters WANT to give John McCain the benefit of the doubt. He is a decorated war hero. And he was the leading voice in strategy and passion for getting the Iraq equation corrected in some of the post-Saddam aftermath. Yet his refusal to do the right thing on border security for so long had left many an American (not mention GOP primary voters) with such a queasy feeling that to this day do not see themselves supporting his candidacy. Thusly when uber-blogger Michelle Malkin, and her cohort Bryan Preston at HotAir, uncovered McCain's daughter's own blog, with a picture of the McCain campaign in operation and Mexican-rights' champion in tow - it spoke volumes to anyone who had misgivings about Senator Cranky. Actually - it confirmed those misgivings and causes us to wonder the damage McCain's "open border" policy would have brought the American people. For all the progress that the American soldier has made in keeping terror at bay overseas it does us precious little good if middle-eastern terrorists are able with their olive skin tone move to Mexico City for a period of time, learn Spanish with fluent Mexican dialect, adopt Mexican dress, customs, and lifestyle then transgress our border while in the midst of illegal aliens simply looking for a better way of life than what they find south of the border. Border Patrol agents confirmed to me in private briefings in 2006 that since January 2003 their agents had detained more than 800 persons of middle-eastern origin on the southern border attempting to enter the country illegally. Of those in more than 60 cases, U.S. Authorities had confirmed ties to an array of international terrorist organizations. September 11th was carried out by one-third as many persons - and THAT was in 2006. By McCain even allowing the presence of Juan Hernandez within his campaign organization's ranks, he confirms the worst that many had feared. John McCain, the arrogant maverick, who opposed the Bush tax cuts, who restricted our freedom of speech with his anti-first-amendment legislation "McCain-Feingold", who sought to undermine the justices being nominated by President George W. Bush, and who served up arrogance and stiffed-neck hostility towards the American people on one of the most worrisome issues of our times - instead of humility and a desire to ensure border security, is a candidate who does not deserve the support of patriotic Americans. Dr. Hernandez's presence, advice, and influence on John McCain demonstrates just how out of touch the Senator still is. Senator McCain has served our nation, in some ways even admirably, and for that we say "Thank You!" Unfortunately that is simply not enough to be our next President, and American citizens patriots should easily understand why.